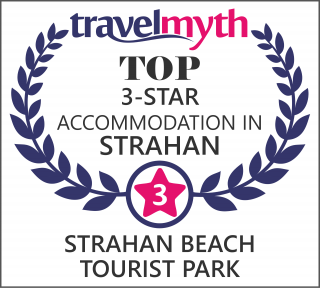 ​Strahan Beach Tourist Park would like to invite you to stay and play at an affordable cabin and caravan park. We are a family friendly park located directly next to Strahan Beach. We have a few different accommodation options: you can stay in one of our 32 cabins, ranging from an intimate queen cabin sleeping 2, to a family cabin sleeping 6, or you can enjoy our well maintained and expansive lawns offering powered and un-powered camping sites. If you are traveling with your family pet they are also welcome to stay with you on our camp grounds.